It’s increasingly apparent that certain customer behaviors are taking hold in this changing world of retail and on-line sales. For instance, we know that 97% of consumers use the Internet to research a product or information about store before making an in-store purchase decision. But what actually gets a potential customer into the store? A recent study about what motivates people to shop in a brick-and-mortar store helps provide a fuller answer to that question. 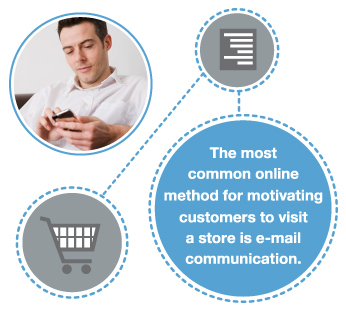 According to a study by Wanderful Media, the most common on-line method for motivating customers to visit a store is an e-mail communication. That’s right, 60% of respondents cited the receipt of “an e-mail or special price or promotion” as leading them to an in-store visit. A very close second place in the survey determined that 59% of respondents “found an online coupon” was also a motivation for an in-store visit. This is useful news for marketers who pay for search, list rentals, and other forms of aggregating customer data. Still, the survey results don’t take results of these on-line experiences to the next logical question: If customers are already attuned to acting on an e-mail communication, how can the customer be personally engaged via e-mail before and after visiting a store? E-mail alone might get someone to visit a website or a store, but it doesn’t demonstrate the retail establishment’s expertise, nor does e-mail alone personalize the shopping experience. To fill the essential function of continuing the conversation via e-mail, Communicate&Convert can be used to enable customers to reach the most appropriate person in the store or department. Once a shopper’s e-mail is received, flexible routing rules send the e-mail to a manager, an administrative team, or directly to a trusted member of the local store’s staff. The conversation might have been prompted via promotional e-mail or search, but in-store experts effectively individualize the more generic conversation. A personalized shopping experience is a powerfully engaging shopping experience. That experience can start when a customer first visits the local store’s website. The positive, personal experience doesn’t have to wait until the shopper enters the store. The benefit of using personal e-mail to communicate with a shopper is clear. They can put a face to the place; the shopper has a contact in an otherwise large retail establishment. The in-store expert, a retail establishment’s experienced associate, has the tools to communicate in with the customer about their specific needs. Communicate&Convert’s threaded e-mail tool means that there is oversight of each conversation through an administrator’s dashboard. Product information and even quotes can be easily added to these e-mails to boost sales. The threaded structure of an e-mail conversation means that the entire history of that e-mail is logged and can be reviewed by managers or administrators. Because a robust reporting suite allows a complete overview of all communications inbound, outbound, and unanswered, no e-mail can be lost or ignored. If an associate is out sick, and cannot reply through the remote capabilities of Communicate&Covert, the e-mail can easily be reassigned to another associate. This traceable flexibility achieves all corporate service level requirements and supports high customer satisfaction. With so many customers accustomed to e-mail communications leading them to websites, it’s only natural to close the loop and continue using e-mail to individualize the communication and demonstrate continued expertise.